Return to the “2014-2015 Premier Play Updates” main article. Pro Tour Qualifiers (PTQs), like all of Magic, have been growing at a rapid rate in the last few years. Regions are seeing PTQ attendances that reach 200, 300, and sometimes even 400 players for one event. While it's great to see so many players trying into qualifying for the Pro Tour, the current PTQ system must adapt to this increase in participation in order to provide a quality play experience for all players. In order to support the rate of participation that Magic Organized Play is seeing worldwide, while adhering to the targeted number of seats on the Pro Tour, a new system must be implemented. The new path to the Pro Tour will be a two-tier series of events that will lead players to their invitations and airfare to the Pro Tour. In this new structure, players will compete in local-level Preliminary PTQs, which begin in December of 2014; winners of these events will move on to Regional PTQs, which will earn top players invitations and airfare to the Pro Tour starting with the July/August 2015 Pro Tour. Players will start their road to the Pro Tour at Preliminary PTQ events. Preliminary PTQ events are open to all players except those already qualified to play in that season's Regional PTQ (more on that below). Every advanced or higher-level store in the Wizards Play Network (WPN) may run a Preliminary PTQ once per season, allowing for potentially more than 3,000 Preliminary PTQs to be held worldwide, each season. Each advanced store can run one Preliminary PTQ per season, open to anyone who wishes to compete. Stores can choose between running a Standard, Modern, or Sealed Preliminary PTQ during each season, regardless of the format the Pro Tour it leads to is. The winner of a Preliminary PTQ will qualify for the season's Regional PTQ. The first Preliminary PTQ season will run December 2014–February 2015, and the Regional PTQ will take place a few weeks after the end of the Preliminary PTQ season. Anyone qualified for that season's Regional PTQ is ineligible to compete in a Preliminary PTQ for that season. The first round of Preliminary PTQs will begin in December of 2014 and will run until February of 2015. These Preliminary PTQs will be the start of the journey toward qualifying for the July/August 2015 Pro Tour. Stores may run a Preliminary PTQ on any weekend during the season (except for Prerelease weekends). Sanctioning for the July/August 2015 Pro Tour Preliminary PTQs will open up to stores in September, and will remain open until late November. Be sure to let your store know about this so it can talk to its local players, pick a format that is right for its area, and schedule its Preliminary PTQ. The winners of Preliminary PTQ events are invited to compete in a Regional PTQ, an invitation-only event that will take place at least four weeks after Preliminary PTQs end for that season. The specific date for Regional PTQs will be announced at the start of the season's Preliminary PTQs, and the format will be the same at all Regional PTQs. These will be run by hand-selected advanced and advanced plus WPN stores, based primarily on accessibility and the ability to host over 100 players. Regional PTQs are planned to be held at least four weeks after the end of the Preliminary PTQ season (the first one ends in February). 31 Regional PTQs will take place worldwide, and qualified players may choose which they compete in. Each competing player will receive an exclusive participation promo card. 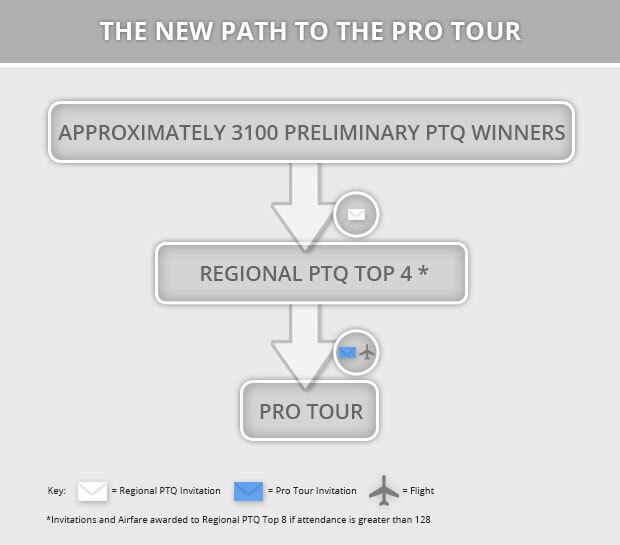 Top 4 of Regional PTQs receive invitation and airfare to the qualifying season's Pro Tour; 5th–8th receive invitations to the next Pro Tour's Regional PTQs. If attendance is over 128 players, Top 8 receive airfare and invitations to the qualifying season’s Pro Tour. These Regional PTQs will be around 100 players in size, and will award the Top 4 of each event with an invitation as well as airfare to the Pro Tour the season qualifies for. Those who place 5th–8th will receive invitations to the next season's Regional PTQ, making their journey a little easier. In order to accommodate for potential growth in the number of players vying for a chance to play on the Pro Tour, invitations and airfare will instead be awarded to the Top 8 of this event if a Regional PTQ has more than 128 players. Regional PTQs will take place on a set date (or dates) each season, and 31 will be run worldwide. In addition, players who qualify for a Regional PTQ may compete at any Regional PTQ that weekend around the world. You are not tied to a specific region's Regional PTQ and can compete in any Regional PTQ if you are qualified. However, you can only play in one regional PTQ each season. In addition to qualifications, Regional PTQs offer an exclusive promo card to every participant.